I love to make this salad for lunch…and we’ve had it for dinner too. My boys aren’t the biggest salad fans, but when I load it with their faves – chicken, apples, cranberries – they don’t seem to mind as much. I’ve got some pecans and dried cranberries leftover from the holiday baking that happened in my kitchen…so I imagine this salad will be making several appearances over the next couple weeks! Also, if you’d like to make a homemade vinaigrette dressing for this salad, I highly recommend this Balsamic Vinaigrette. It’s my go-to homemade dressing! Pull apart the rotisserie chicken, if needed. 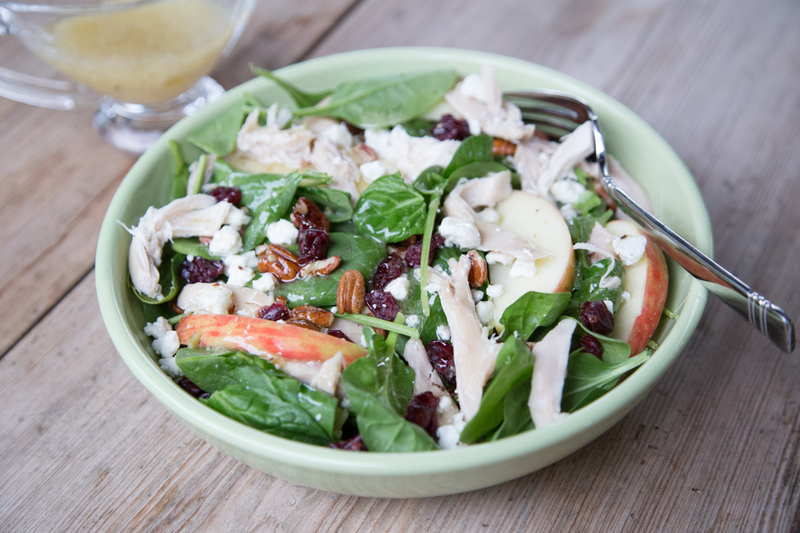 In a large mixing bowl, toss together the baby spinach leaves, the shredded chicken, the dried cranberries, the pecans, the apple slices and cheese crumbles. Add in desired amount of vinaigrette and toss well. If preferred, make your own dressing. 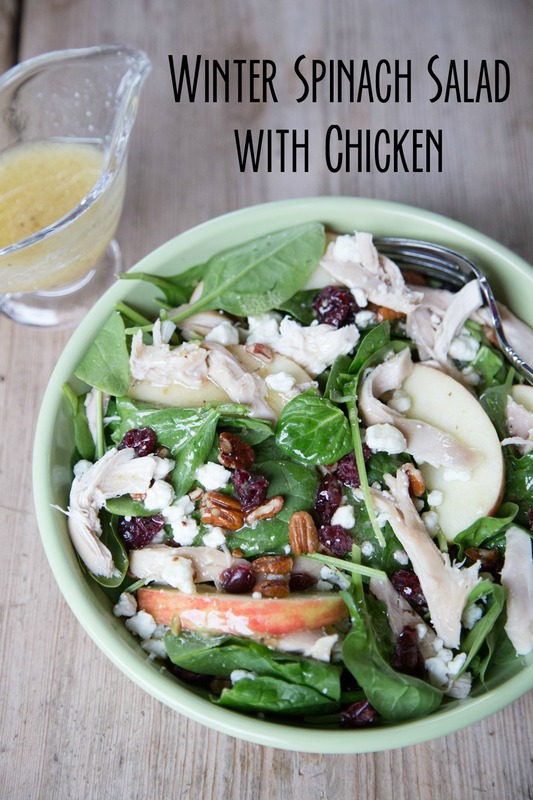 Serve Winter Spinach Salad with Chicken. Pin all of our 31 Days of Rotisserie Chicken Recipes here! 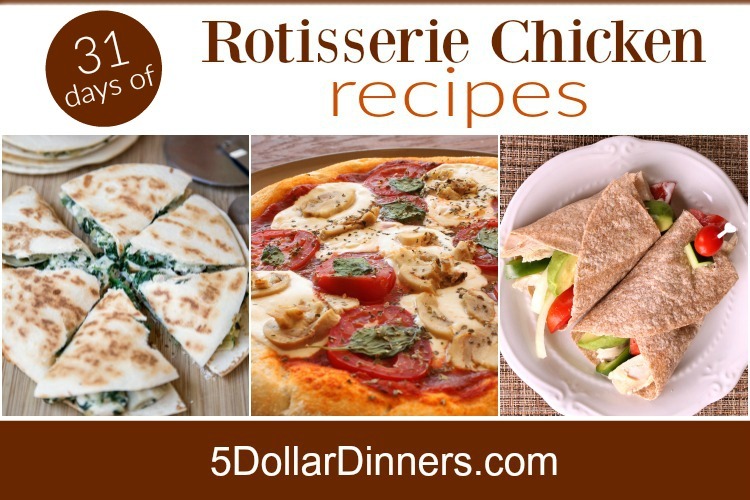 Follow $5 Dinners’ board 31 Days of Rotisserie Chicken Recipes on Pinterest. See all of our 31 Days of Rotisserie Chicken Recipes here!